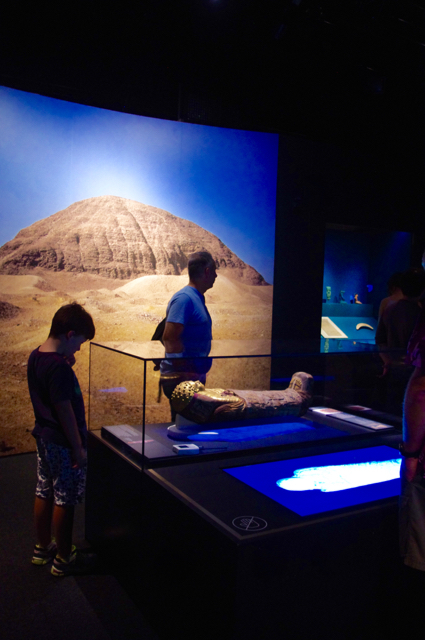 We recently visited the Egyptian Mummies: Exploring Ancient Lives exhibit at the Powerhouse Museum here in Sydney. Having grown up in Paris, I frequently visited the Louvre Museum's Egyptian collection which if you have visited would know is quite large. 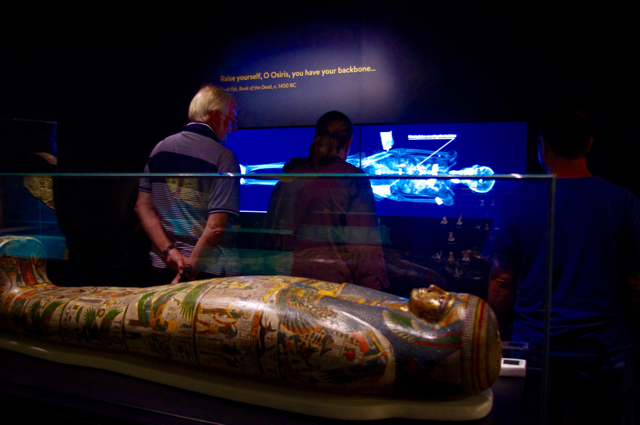 While the Egyptian Mummies exhibition at the Powerhouse Museum is smaller - the information, technology and information on display are a fantastic introduction to Egyptian mummies without the long haul! During your visit, you will admire six ancient Egyptian mummies, not all shown in this review. The mummies are of Nestawedjat, Tamut, Irthorru, Temple Singer, a young child from the Roman Period and a young man from Roman Egypt. You will also see artefacts from ancient times, learn about the meaning of writings on their coffin, the rituals of mummification and how they ensured that the deceased were granted access to eternal life and much more. 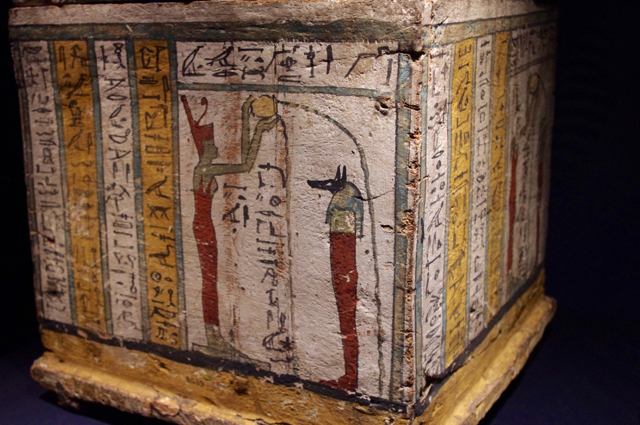 Some beautiful artefacts are on display like this beautiful canopic box used to store small canopic jars. 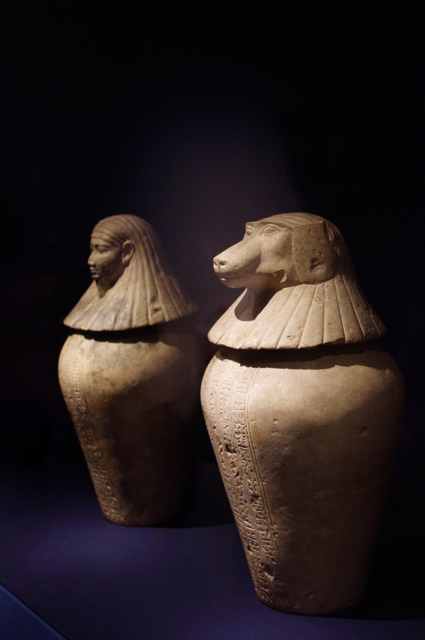 Canopic jars were used to store removed organs in the process of mummification. In the 19th dynasty and later each of the four lids takes the form of a different head falcon, human, jackal and baboon (denoting the four children of Horus). The four canopic jars were also buried with the deceased. You can also see beautiful parchments showing Atum and Thoth and beautiful inscriptions in the mummies' coffins. 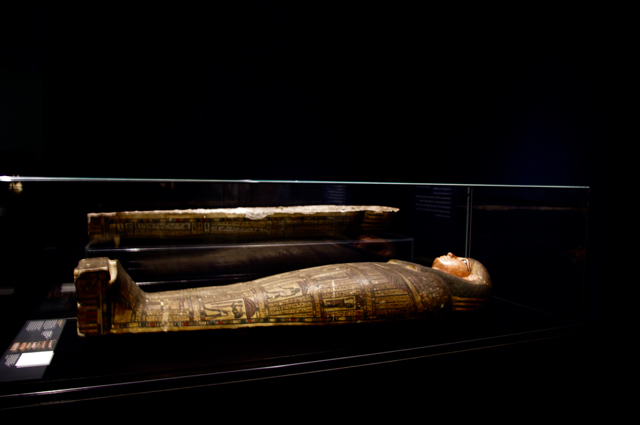 What makes this exhibition different from other Egyptian exhibitions I have seen, is the way technology was used to look through the mummies' coffins to look at their skeleton, their bandages and artefacts which they took to the after life with them. I was told by one of the Museum's volunteers that this particular mummy (shown below) was called the Temple singer and she wore various amulets that you can see on the scan. One of which was an amulet on her throat to protect her voice in the after life. The volunteer also showed Little Miss and I replica amulets made using 3D printing which was quite interesting. The mummy of a young child from the Roman Period is also shown along with the 3D CT scan of the mummy's skeleton. Primary school aged children will be fascinated with this exhibition. I know I was at that age I couldn't stop thinking about Egyptian history, the pyramid and the mummies! 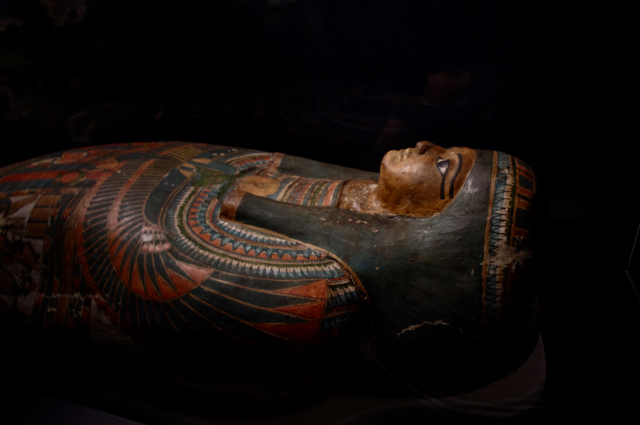 If you are keen to photograph the mummies at the exhibition, please be aware you are not allowed to use flash photography however you can use your phone and digital camera. I was able to capture these pictures and the detail of some of the subjects using my digital camera so equip yourself before you head to the museum. I really liked the Egyptian Mummies: Exploring Ancient Lives given my love for Egyptian history however little Miss who is 4 didn't quite appreciate it as much as I did. She did look at everything, liked talking to the volunteer regarding 3D amulets and looking at the mummies and going through the little pyramid hole in the wall for little ones however she was too young to fully appreciate it. This was to be expected as the Powerhouse Museum's recommends that the exhibition is suitable for primary school children, teenagers and adults. She did however enjoy the Dig Discovery Zone, Creative Oasis and Story Corner and so did her little brother. They loved unearthing objects from the archaeological dig pit and create an Egyptian necklace on the craft table and meet a Pharaoh. 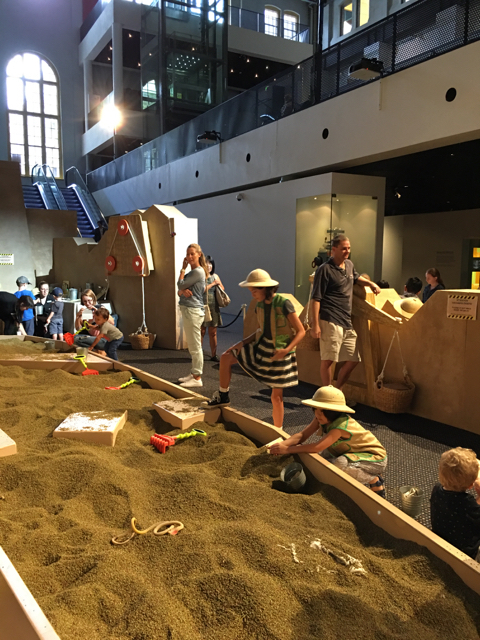 Every Sunday in March from 10am to 4pm around the Dig Discovery Zone at the Powerhouse Museum, kids can explore ancient Egyptian lives through either the eyes of an architect, artist, archaeologist or a pharaoh. 'Egyptian Mummies: Exploring Ancient Lives' is on at the Powerhouse Museum until Sunday 30th of April 2017. For more information, head to the Powerhouse Museum's website. For more info March Sundays, head here.